DURAhome is resilient in responding to environmental disasters, such as Hurricane Sandy. 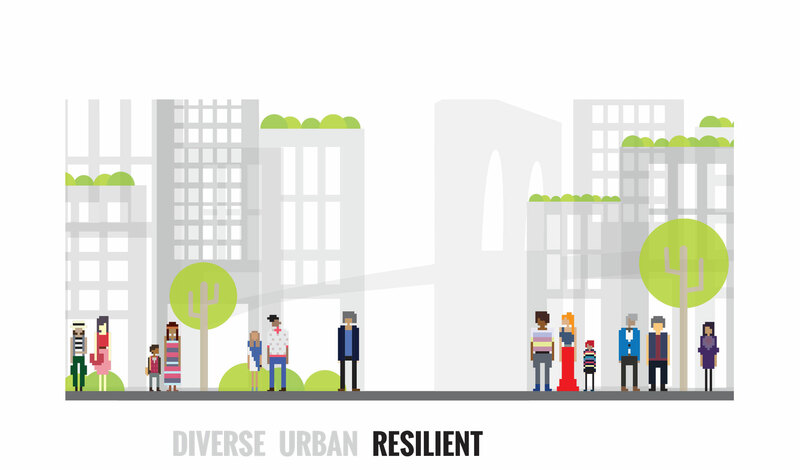 Proximity to the floodplain and the rising sea levels of the Atlantic Ocean increase the need for proactive resilient design in response to the threats of flood water, gale force winds, and seismic activity. The DURAhome is designed for optimal performance and works for the changing climates in fast-growing, populated cities. The engineering strategy for DURA is based on overall efficiency and user-friendliness of the house’s technology. Emphasis is placed on making the homeowner feel at ease with the use of advanced and integrated technology. DURAhome is a hybrid of passive solar and passive house design principles, coupled with low energy active systems. With our off the shelf assemblies, combined with these integrated technologies, the user will feel in control of their home environment. Mechanical systems within our 6.5 kW array include photovoltaic panels, a greywater system, low-energy mechanical and water harvesting, as well as Energy Recovery Ventilation (ERV). The photovoltaic panels track the sun seasonally to allow optimal placement and, in turn, optimal power output. Solar thermal panels will be installed to maximize the efficiency of our PV panels. Thermal electric panels will convert waste heat from PV panels into electricity. A heat chimney will heat the home throughout colder months of the year and cool the home in warmer months. A trombe wall will regulate temperature swings to ensure consistency. We have put careful consideration into making our DURA home as efficient as possible. Of the average national indoor residential water use, the toilet is the greatest water user, at 60-70 gallons per day per person. Greywater is essentially lightly used waste water acquired from activities like washing clothes, hands, and dishes. 50-80% of residential water ends up becoming greywater before going to the sewers. We can offset both unfortunate statistics by taking the greywater that we produce daily and using that water for toilet purposes, as opposed to using fresh water. During natural disasters or times of droughts, greywater can also be extensively filtered to water plants with, or even to be used as potable drinking water. Using roof runoff, rainwater will be harvested and stored in tanks to later use for watering our outdoor garden and our greenwall. Several Passive House elements reduce energy consumption by simply letting the earth’s natural systems do the work for us. The house will be thoroughly insulated above and beyond code requirements, as well as built in an airtight envelope, in order to optimize energy loss prevention. Thermal mass will also be drawn upon to minimize temperature fluctuations by absorbing heat when the room temperature is hotter than the mass, and releasing heat when the room temperature is cooler than the mass. Our walls will be constructed so that they do not lose their R value in extreme temperature change, or when exposed to high moisture. Glazing is essential in preventing energy loss, as windows and doors are the number one sources of heat gain or loss in an insulated building unit. Glazing may not only prevent unnecessary heat loss and gain, but also reduce glare and improve internal lighting. Our windows will also be triple paned so as to maximize efficiency.